This entry was posted in Events, Middleton on Wednesday, March 24, 2010. The long winter has most Midwesterners itching to get outside and have some fun. For those looking to stretch their wings this spring, there are great events happening in communities throughout the Badger State. Whether you’re an athlete, artist, nature enthusiast or music lover, you’re sure to find the perfect excuse for a spring getaway. In Vilas County, winter lasts a long, long time. When spring finally comes to the Northwoods, it’s a real sight to behold. A great way to experience the natural wonders of springtime in Wisconsin’s most beautiful woodlands is the annual Journeys Marathon. The marathon is run on the second weekend in May. The course winds around Vilas County’s lakes and forests as it takes runners from Boulder Junction to Eagle River. The mild spring temperatures are ideal for the race. For those looking for a shorter race, there’s also a Half Marathon, a 13.1-mile power walk, a 5k and a Kids Fun Run. Put on your running shoes and hit the woods. Learn more about other Vilas County spring events. The Horicon Marsh Bird Festival is held Thursday to Monday over the first full weekend in May. It is an annual gathering of bird and nature lovers from around the country for four days of birding tours by boat, bus and foot through the incredible Horicon Marsh in Dodge County. Learn about the mind-boggling migrations of neotropicals. Learn to identify nocturnal birds by sound. Learn firsthand from biologists and birding experts. Presentations, hands-on demonstrations and fascinating speakers are scheduled throughout the festival, including a presentation by naturalist, author and photographer Stan Tekiela. Get more festival information and find other area events. Those looking to encourage the blossoming of their own inner artist should learn about the Artists Interactive series of exhibits, classes and hands-on demonstrations in Price, Vilas and Oneida counties of northern Wisconsin. During the late spring, artists who live and work in the Northwoods will be showcasing and sharing their talents with visitors. Through classes and hands-on demonstrations, you’ll have a chance to enrich your own artistic abilities and learn new skills. Artists Interactive classes include painting, woodworking, ceramics, quilting and more. Learn more about Artists Interactive and register for classes and events. This entry was posted in Article, Boulder Junction, Oneida County, Rhinelander, Spring, Vilas County and tagged Spring on Tuesday, March 23, 2010. The spring and fall migrations are annual events that birdwatchers live for. The spring migration, in particular, is like the world-series of birdwatching. Occurring after the long winter months and when most birds are adorned in their peak plumage, the spring migration is the very best time to be out in the fields, forests and marshes with your binoculars. And the absolute best place in southern Wisconsin to witness the migration is the Horicon Marsh in Dodge County. The northern half of the Horicon Marsh is protected as a National Wildlife Refuge and is maintained for optimal habitat maintenance. The refuge was originally established as a nesting area for the redhead duck, which has flourished in the optimal habitat afforded by the marsh. But what was good for the redheads was good for other hundreds of other bird species as well. During the course of a typical year, nearly 300 types of birds either visit or live on the marsh. April is the peak of the spring migration at Horicon Marsh. New species are arriving and departing the marsh on a daily basis. Depending on the day, you’ll have a chance to see bald eagles, osprey, a variety of rails, numerous warblers, numerous species of diving ducks and puddle ducks, and several species of shorebirds. For birders looking to cross off some birds on their lifetime list, Horicon in April is the place to be. One of the best features of the Horicon Marsh is the variety of ways birders can enjoy the marsh. The refuge has a number of observation areas and trails to choose from, including the Horicon TernPike Auto Tour in the northwest quadrant of the marsh, just off Hwy 49. A short drive or hike on the TernPike will take you to the floating boardwalk, where birdwatchers are afforded a water-level view of some of the best wetland birdwatching east of the Mississippi River. Guided pontoon boat tours are available at the south end of the marsh in the City of Horicon from Horicon Marsh Boat Tours. And the Horicon Marsh International Education Center, located at the south end of the marsh between the communities of Mayville and Horicon, offers information on both birding and other ecological features of the marsh. Learn more about planning a Horicon Marsh spring birding trip. This entry was posted in Article, Spring and tagged Spring on . Just an hour south of the 50 km course for the Midwest’s most famous annual cross-country skiing event—the Birkabeiner in Cable—you’ll find a landscape of rolling hills and quiet forest glades known as the Blue Hills. Cross-country skiers and snowshoers visiting the area will find lodging, dining and shopping in nearby Rice Lake and the small towns of Rusk County. The Blue Hills are overshadowed by the more famous Birkie in name only. For ski trail quality and woodland scenery, the Blue Hills can’t be beat. 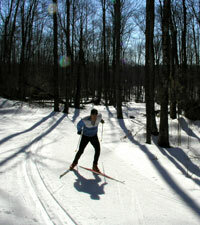 The Blue Hills are home to several trail systems, boasting hundreds of miles of the best skiing in the state. Snowshoers will find several Blue Hills trails for trekking. Get maps and trail info for all Blue Hills area trails, visit www.bluehillswisconsin.com. This entry was posted in Article, Rusk County, Winter and tagged Snow, Winter on Monday, March 22, 2010.